When Harewood House, Leeds was built in the 1770s, its state bedroom was fitted out in the highest style of elegance and kept in readiness for visiting royals. Alas, fashions in aristocratic status symbols changed, and the bed was dismantled and stored in the roof void of the stable block until rediscovery in the 1970s. The task of restoring the bed was taken on by London firm Carvers & Gilders, with Aasha Tyrrell co-ordinating the project. And the hugeness of the undertaking is apparent upon entering the 'by royal appointment' workshops. I stood transfixed while assimilating the splendour of the glittering results eight months into this mammoth year-long project. Four months before the exhibition was due to open, see panel, a team of carvers and gilders was calmly and methodically working away to a logical order that Chippendale would have approved. Said Aasha: "We've been involved with the bed for 10 years. We were doing other work at Harewood House and knew that at some stage the money would be found for the project. "It's a very big task. The bed was quite badly damaged by water. It was in store and obviously everyone was aware it was a very special piece. 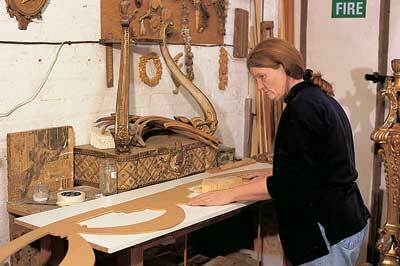 "The carved ornament was very broken and we had to stabilise some areas of rot. The supporting structure of the dome was blocked up in pine, and due to shrinkage we've had to put in fine slips. The posts are mahogany. The carved ornament is in limewood and the bed rails and slats are oak. "It was a great conception, a very grand bed even in its day. Everything about this bed is really quite superb. 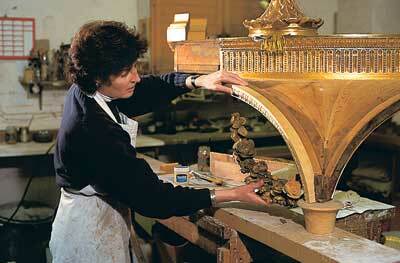 "We treated it for woodworm in the early days and documented existing and missing carving." A team of historians and academics worked with the restorers to build up a picture of the bed. They had the original accounts, detailing cabinetwork, hangings, valances and carvings, but no drawings. "The only decorative elements that were missing were original plaster tablets from the centre of cornices and the three cornices of swagged roses." The house was searched for any fragment of evidence, perhaps in watercolours, but nothing was found. Nail and tack marks, however, mapped out which pieces fitted where. "We didn't have the original plaster casts but knew they were classical mythological scenes, so rather than reinvent we found a plaque of Venus and Cupid in the centre of a fireplace known to have been carved by Chippendale and of the correct scale." Said Aasha: "There were no cornice drawings but it was clear from the detective work that we had it about right. "We know that the moulding was fixed from the inside. The dome, in two pieces, fits on capitals and Annabel Westman [responsible for the drapes and hangings> knows how much rope and tassels were used and where they would have hung from. "Chippendale's ornament was logical and planned; everything worked." "We searched the house when we first started to be aware that swags of roses were missing. Our eyes were out for anything that might help us. We brought down a range of different swags and found three of the right scale." The team ended up with enough original material to work on, and decided on four swags on each of the open sides beneath the dome. Another proof of the success of their detective work was that the cut-out on the back of the original swags just fitted their own best-guess ogee design for the mouldings. Said Aasha: "It's hard to say if these were the very swags but it seems possible because it cross-refers both ways." The work of recarving nine of the 12 swags was put in the hands of Christine Palmer and freelance Paul Jewby. Said Christine: "The curves all work. Each side has something of the original left in them. "All the detail is in wood rather than gesso. We're trying to get the crispness back so that we could gesso it again as it should be." As she talked she was joining up a section of a newly restored original roses carving to a new block, preparatory to gluing up with Scotch glue and carving the replacements. She showed me fine crack lines on the originals and commented: "The fact that they have been repaired is evidence that it is fragile." She believed that the damage would most likely have been caused when the bed was first installed, and observed: "It's quite comforting to realise that they had the same problems we do." I asked her if she took any modern technological short cuts. Standing in front of her collection of new and Victorian chisels and gouges, she said: "There are no short cuts - that's what something like this teaches you. There's so much joy here in all that we do," she declared, as she sanded off by half millimetre increments to make the fixing as smooth and flush as possible. "There are different degrees of interpretation and we are very critical of each other which is good because we are getting closer to the truth and not going off on a fantasy detour." 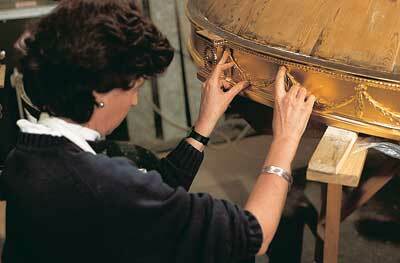 But all good rules have to be broken sometimes, as in the method of fixing gilded moulding onto the dome. Here, Aasha was using an gun to shoot pins invisibly through the moulding. "It would have been done with needles which would have been tapped in, but needles rust so I'm using coated pins that don't corrode. It's far less damaging because it's much finer than needles which also stick out." In the next-door unit, furniture designer-maker James Coddrington used his skills to great effect, making up bed slats and the lower structural frame, in so doing correcting a warped piece of work which was the result of some unfortunate cabinetmaking between whiles. 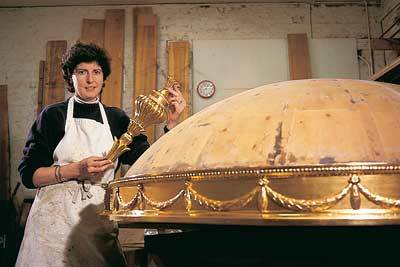 There was very little of the original gesso burnishing clay and gilding left, but the team was able to be guided by the urn finial which sits on top of the dome. Although dirty and in some areas perished, the original was largely retained. Said Aasha: "It was fortuitous for us to have this particular example of gesso and clay. 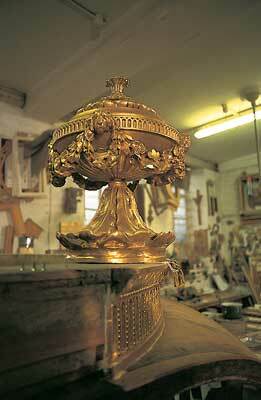 There was clear evidence of the way they had toned and burnished the original gilding. The original burnishing scheme gave us a good idea of the importance of the burnish to give a rich decorative effect. The quality of the gilding and burnishing and the colour of the gold on this original piece has been pivotal on the treatment of the rest of the bed." So how did the team, which also included William McCombe, Sarah Eggen, Mandie Sabot, Alison O'Brien and Bob Taylor, progress the project? The first step, said Aasha, was to make sure that all original carving was retained, strengthened and put back into position to see what was there and what was missing. We have made use of every fragment possible and, where delicate, have used a linen backing to hold it together." The next step was to break the work down into sections, taking the bed posts, four finials and the castor covers which hide the lower structure of the bed frame as one unit. The lower structure for the dome makes another unit. 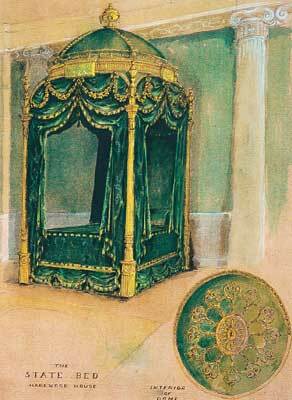 The dome support has enormous amounts of applied highly decorative carved mouldings applied over green silk, the choice of fabric being determined by a remaining fragment. Lastly comes the dome itself, with all the gilt ornament applied on top of the silk. A piece in the centre of the dome was an example of the condition before work started. In five or six fragments, it had been exposed to damp and was wormeaten. Said Aasha: "We inherited the bed with the gesso and gilding already removed except for the top and finials but we had to clean the wood again to remove the chalky residue of perished gesso. "We consolidated the timber where it was extremely perished and wormeaten. "Then we had to damp a lot of it in order to reform it to its original contours, and pin it to dry into shape." New carvings are having to be accurately spliced to the retained and restored fragments and "a lot of quality work done" to regain the surface. Lastly came the toning and burnishing of the gilding, involving applications of a thin gesso, followed by yellow clay, then burnishing clay and watergilt. Interestingly, some of the gilding alternates to catch the light between a matt and polished finish. Fingers and toes were being crossed for the assembly. Said Aasha: "Getting the dome structure on top of the posts will be most complicated without much headroom, but we'll be doing it with assistance from many experienced people. A final word from Christine: "I'm hoping they'll give us a chance to sleep in the bed, but I don't think there'll be much chance of that!" "The quality of the gilding and burnishing and the colour of the gold on this original piece has been pivotal on the treatment of the rest of the bed"
Carvers & Gilders is owned by Christine Palmer, Aasha Tyrrell and William McCombe who operate from workshops at 9 Charterhouse Works, Eltringham Street, London SW18 1TD, tel 0208 870 7047. 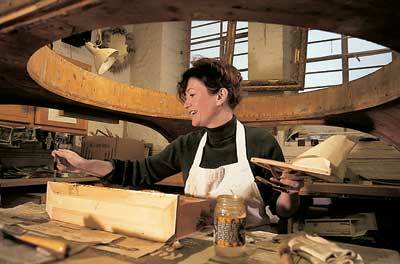 The company was founded in 1978 and received its royal warrant 10 years later. 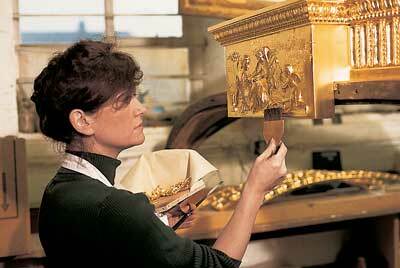 Royal Collection work includes restoration at Hampton Court Palace and at Windsor Castle.